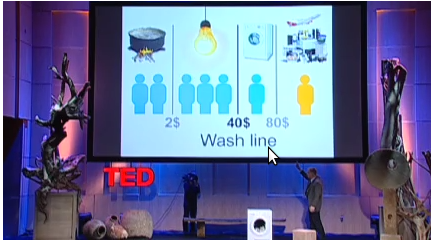 If you've been following TED, I may count you among the legion of fans of Professor Hans Rosling. He has presented several compelling lectures on global health and related topics. I recommend watching his set of 9 presentations given at different TED conferences. I've mentioned him earlier in Bold and Panacea. So this is the third post on one of his recent talks - "The Magic Washing Machine". In this particular talk he presents the global socio-energy-econimic situation using a remarkably simple yet incredibly powerful 'Line' graphic. The graph divides the world into four segments divided by following lines. Having crossed the Wash line recently (post marriage on 9/11), the slide presents an elegant representation of the kind of disparities currently existing, especially on energy and resource consumption front. It's just 9 minutes. Go watch, and then watch all 9.
p.s. - I bought Whirlpool Whitemagic 700h in September 2011, which neatly coincided with me crossing the $40 line.